As a distinctive selection of matels, the Design Series is for those with a finer appreciation for design and craftsmanship or for those looking to stay ahead of today's current trends. 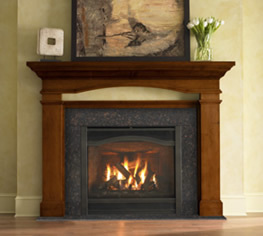 Shown on the right is the 6000GLX features a Portico mantel in chocolate maple, black granite with curved hearth and Arcadia front in new bronze finish. Other available styles: Manhattan, Parsons, Philips Hall, Savannah, Sonoma, Luxor.